You and your friend chills. Poetic Insights on corporate life by a reluctant traveler. Irreverent and blasé, the dedication and preface are sure to make you browse through this collection. Take a look at it and you will know why! As the poet himself puts it, you can't read poetry from end to end, so just pick up the book and read, at random and so I did and liked the voices he raised, very interesting. He writes on every day feelings and emotions. Keen observer of human nature, a lot of self analyses and self deprecating humour woven into his work. 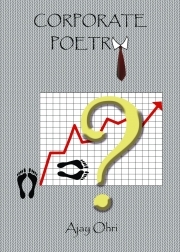 Corporate Poetry especially, expresses his opinion on corporate life: scathing and ruthless! !